From the cello to the electric guitar, and a curiously strange concerto by Romanian composer Iancu Dumitrescu (husband of Ana-Maria Avram, featured on 5:4 last year). 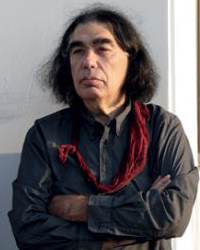 Particularly well-known (and self-described) as a composer with ‘spectralist’ leanings—but not, according to Dumitrescu, in the same way as the French spectralists—his guitar concerto Élan and Permanence seems almost to go out of its way to reduce or at least radically rethink the role of the soloist. Even describing the guitar as a soloist is stretching a point. Uncertainty reigns throughout the piece, both in terms of the way material is articulated as well as the material itself. Utmost abstract, much of the music takes place as if from a distance which, considering how much energy is regularly displayed, makes for a decidedly weird listening experience. The energy bubbles up to the surface of seething textural masses, punching outwards in the form of brass reports, coagulating into clouds of string tremolandi and unleashing wild percussive outbursts that have a distinctly Varèsian sense of autonomy. This orchestral behaviour, which subsides into glades of middlegrounded repose as much as it lets rip, is curious enough, but the way the guitar interacts with it—if ‘interacts’ is the right word (i don’t think it is)—is downright odd. The soloist occupies itself with very low throbbing pitches that glower from the depths, pitches that move inscrutably, caked with distorted detritus and fuzz. Later, they develop into drones, hums, throbs and squeals, extending into an equally exotic form of expression that sits well with the orchestra simply due to their mutual oddness. In this respect, the question remains of whether there’s any rapport at all between guitar and orchestra, or whether they regard each other with complete indifference. Put it this way, if there is something approximating a relationship, it’s the orchestra that wears the trousers, riding roughshod over the guitar in col legno clatter and suspended cymbal splashes. This reduces the soloist, in every sense of the word; certainly by the closing minutes, there’s nothing recognisable left of the guitar, leaving the orchestra to wax triumphant with a rolling and pitching texture like being on a very choppy sea, before closing inward in a bizarre coda, full of strange sounds and resonance. Exquisitely weird. This first performance of Élan and Permanence was given at the 2013 Tectonics festival in Glasgow, by guitarist Stephen O’Malley with the BBC Scottish Symphony Orchestra, conducted by Ilan Volkov.